Stephen Gonsalves got his season off to a great start, throwing 5.1 no-hit innings for Chattanooga. He was removed after 71 pitches, following an early-season trend of the Twins’ affiliates being conservative with pitch counts. We also saw Cedar Rapids win its first extra inning game under the new rules implemented this season. Welcome to the Saturday Speed Round! Things are going to look slightly different, but hopefully you’ll still get all the great information you’re accustomed to seeing in the minor league reports here at Twins Daily. That’s back-to-back postponements for Rochester, as the Red Wings have yet to make their season debut. The teams will play a doubleheader at a later date. There’s still just one game scheduled for tomorrow. What a pitching performance. Gonsalves set the tone with 5.1 no-hit innings. He walked three batters and had “only” three strikeouts, but the Barons only managed to hit four balls out of the infield. Tyler Jay was responsible for the lone hit the Lookouts gave up tonight, but he also pitched 1.2 shutout innings with a pair of strikeouts. Zack Jones walked two batters over a scoreless eighth inning before Ryne Harper staked his claim to the Chattanooga closer role. He struck out the side in a perfect ninth inning, needing just 13 pitches to do so. Tanner English led off the third inning with a double and scored on an Edgar Corcino sac fly. In the seventh inning, Sean Miller hit a single that scored catcher Wynston Sawyer. Barnes struck out eight of the 20 batters he faced, but a couple of of his pitches the Stone Crabs made contact with really hurt. He gave up a two-run homer in the first, but the bats fought back to give Barnes a 4-3 lead heading into the bottom of the fifth. Unfortunately, Barnes surrendered another two-run homer. Max Cordy gave up another three runs over 2.1 innings of relief. Carlos Suniaga, who pitched for E-Town last year, had a successful FSL debut, throwing a perfect inning. Aaron Whitefield drew three walks and scored a run. Blankenhorn now has five extra-base hits in three games this season. This game went into extra innings, meaning we got our first look at the new format where a runner starts the inning on second base. Instead of intentionally walking the first batter to set up a double play, Cedar Rapids manager Toby Gardenhire let his guys go to work. The decision paid off. The leadoff batter flew out, Ryan Mason picked off the runner who had been gifted second base to start the inning and then he struck out the next batter. Can’t get much better than that. The River Bandits also decided against the strategy of intentionally walking the leadoff batter in the hopes of inducing a double play. That decision did not pay off. Lewis led off the inning with a ground ball to the third baseman. Akil Baddoo, who started the inning on second base, broke to third on the play. The Quad Cities third basemen tried tagging Baddoo, but missed. Alex Kirilloff, the next batter, delivered a sacrifice fly, scoring Baddoo to walk it off. Interesting to see Carlos Suniaga pitch tonight. He was brought across the parking lot from EST. Curious the roster move. I see Andro Cutura has been assigned to the Kernels, so maybe that's it. Though I'm sure Suniaga will go back to EST as soon as someone comes off the DL. Nick Gordon and Travis Blankenhorn have been fantastic through two games each. Blankenhorn's got four doubles and a homer in like 8 or 9 PA.Gordon's like 5-7 with two walks, a double and a triple. Of course, getting excited about two games makes about as much sense as worrying about Brent Rooker starting 0-7 with 4 strikeouts. I think Nick Gordon deserved the Co - hitter of the day with Lewis. Gordon got on base 3 out of 4 times up, got a double and stolen base. The tie breaker for me was that Lewis was more instrumental to his team winning. I would have gone Gordon too, but that's the fun of having different writers, and then we can all discuss the choices in the comments. Lewis' plate appearance in the 10th was scored as a fielder's choice, so no hit, but there wasn't an out recorded on the play. Next batter hit the walk-off sac fly. So I'm also giving Royce some extra credit for putting the ball in play there in the 10th to force the opponent to make a play, which they could not. Also, a run scored on the double Lewis hit to put the Kernels up 3-2, but he didn't get credit for the RBI because it was an error that allowed the runner to score. I'm trying to get my friends at Twins Highlights (wink, wink) to upload some video of that finish, but the archive of that game is not available yet on MiLB.tv. I'm sure it'll take a little time after missing a year, but I wouldn't worry about two games. He'll be fine. Video has been added to the Kernels section. One could have made an argument that Baddoo went out of the base line to avoid the tag. I'll note though that Rooker did this both in Etown and the FSL last year. He seems to adjust quickly, and hopefully this is just a blip. Quad Cities certainly made that argument... But the 3B was playing in, and the runner does get some leeway. Aggessive baserunning? If he had been tagged out, it would have been stupid baserunning. I really like Baddoo but I think that was a poor baserunning decision. The minor leagues are for learning what little gaps to exploit. Those gaps become fewer in number as they rise to the majors, but I want my players looking for them nonetheless. If you force it and the other guys don't make the play, that's something to remember. Later, as you move up, you force it and the other guys do make the play; you remember that too. Then, at the majors, you hopefully have learned what works and what doesn't. But, never losing that aggressive instinct is a good thing. I'm not going to second guess a play that worked, when it's in single-A. Never second guess a play that worked? That can encourage poor decisions. For example, a player runs throw the third base coach's stop sign and the throw has him beat by 20 feet. The catcher drops the throw and kicks it out of play. I would not only "second guess" that decision, but also provide a short lecture on why the third base coach makes decisions. Just because a bad decision turned out okay doesn't make it a good decision. Thanks to the top prospect recap summary I see Tyler Jay made an appearance yesterday! How's he looking these days? I kind of forgot about him as a bullpen option. EDIT: Also, did he ever end up having a surgery to fix his ailment? Or did rest and rehab do the trick? Is that what happened? I don't think I'd second guess a coach reading the riot act to a player who engaged in even minor insubordination, either. Anyway, "never" is a strong word. Maybe I didn't add my usual volume of qualifiers in what I wrote there. I share the desire to see Gonsalves in MLB.Nice to have some good pitchers around the team again. No, he never had surgery. The rest and rehab did the trick. He looked fine this spring. He's not a big guy, but he's got some really good stuff. Yes and no... As a coach, you want to encourage aggressive, but smart decision making. In the case last night, I thought Baddoo made a good, aggressive move. The 3B was in. He had to dive. Baddoo was off of 2B already, and yes, he was able to make it. I would say this though... especially in the lower levels, managers and coaches should (and often do) question players. They let catchers call the games, and then they talk about good and bad pitches between innings and after games. For fast guys, they encourage them to try to steal bases, understanding they're probably going to go at some non-good situations, but they can learn from those situaitons, and they'll talk through those situations. I think most coaches will encourage aggressive over passive. And most coaches/managers in the lower levels love teaching and this is part of it. That was a long answer basically saying that there isn't a direct answer to that question. 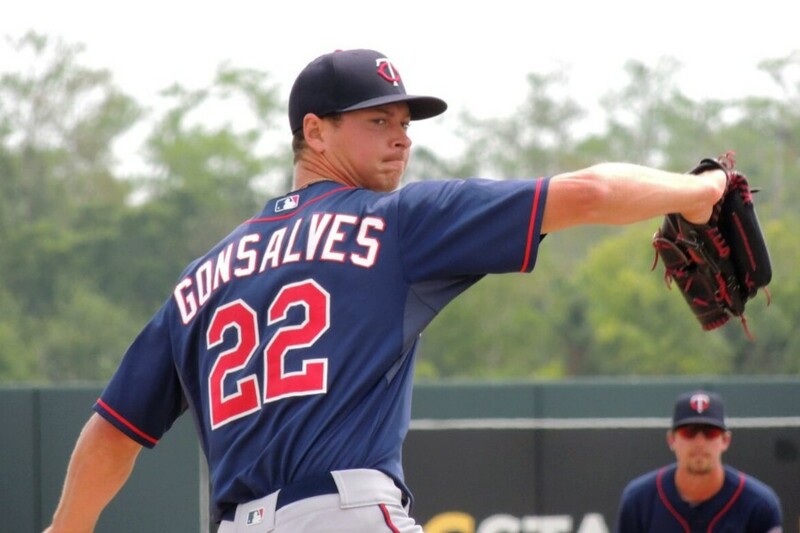 Only in the Twins organization does a guy like Gonsalves move backward. He already has pitched 162 innings of AA baseball between 2016 and 2017.He has a career AA ERA of 2.21 with 188 strikeouts, and a career minor league ERA of 2.36. So, even though he finished the 2017 season in AAA, the LOGICAL thing to do is send him back to AA. Yep. Because literally every organization is the same and has the same players.